PADI Project AWARE Specialty - FREE! Join the Team at NZ Sea Adventures for a FREE Project AWARE Specialty evening on the 12th of October. All divers and curious Non-divers are welcome with an optional certification counting towards a PADI Master Scuba Diver rating for just . Normally $135pp! Project AWARE were originally formed in 1989 as an environmental initiative by the Professional Association of Diving Instructors (PADI). Project AWARE existed to increase environmental awareness through diver education. 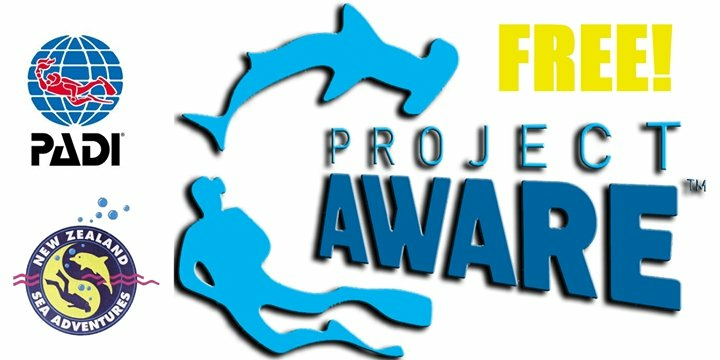 In 1992, with tremendous support from the dive community, Project AWARE Foundation was registered as an independent 501(c)3 nonprofit organization in the U.S. To engage divers and activists around the world in conservation, Project AWARE became an established UK charity in 1999 and received formal nonprofit status in Australia in 2002. At NZ Sea Adventures we have been including the PADI Project AWARE Specialty course in our diver development programmes and as advocates for the health of our much enjoyed underwater world. We encourage those interested in the sport of scuba diving to attend and experience our hospitality and programmes, to meet the team and some of the Crew who also share the same passion for the ocean environment. No financial commitment is required or fee's compulsory, just a nice way to learn about what's happening locally and globally plus things we can all do to protect and preserve this valuable resource we call our ocean. Project AWARE membership is also free, you can register and participate in events in your local area and anywhere in the world.